The AA transporters expressed by mammary tissue do not appear to be unique to the organ (Baumrucker, 1984, 1985). 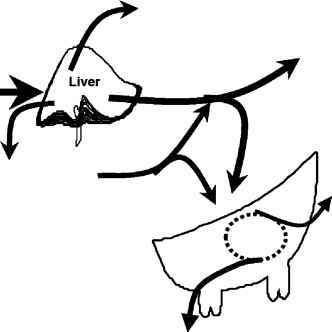 Although mammary transporters have not all been completely characterized in bovine mammary tissue, they have been characterized in other species (see Shennan, 1998) or in other cell types (see Christensen, 1990). These transporters exhibit saturation kinetics; however there is a non-saturable component that is thought to represent diffusion. Maximal velocity of the saturable element is achieved at concentrations that greatly exceed the in vivo range such that within the normal in vivo concentration range uptake kinetics are generally linear. Transport of AA under normal physiological conditions, therefore, would appear to be limited by substrate concentration and transporter capacity. That is, a change in either the number of transporters (or the activity of expressed transporters) or in the concentration of AA at the cell surface should result in a corresponding change in unidirectional removal of the AA. Transport of AA across the cell membrane is bi-directional (Baumrucker, 1984, 1985). Efflux from mammary tissue (cells) appears to be driven by intracellular concentrations (Bequette et al., 2000) although this has not been well examined in vivo. If influx and efflux rates are concentration dependent, then fluctuations in intracellular and extracellular concentrations modulate net transport. It has also been observed that transport activity is regulated by intracellular concentration of AA (Christensen, 1990), possibly through regulation of protein translation by uncharged tRNA (Iiboshi et al., 1999). This mechanism potentially provides a link between the rate of intracellular milk protein synthesis and regulation of AA uptake. In mammary tissues, AA are concentrated within the intracellular pool relative to the plasma compartment (Clark et ai, 1980). An energy source is required to establish and maintain this concentration gradient. Several transporters use Na+ as an exchange molecule, taking advantage of the concentration gradient of Na+ maintained by Na+/K+-ATPase activity (Baumrucker, 1985). The L-system, in turn, takes advantage of the AA concentration gradient maintained by the Na+-transporters by counterexchanging intracellular AA for extracellular AA (for review see Baumrucker, 1985). As each transporter generally has affinity for more than one AA, there is potential for antagonism among AA wherein elevated concentrations of one AA inhibit transport of other AA. However, most AA can be transported by more than one transporter (Baumrucker, 1985; Shennan, 1998), and so this potential antagonism is probably partially negated. Additionally, it would seem that the ability to regulate transporter activity and the presence of multiple transporter types would tend to mitigate not only antagonisms but also deficiencies in a single AA (Bequette et al., 2000).